Are you looking for the perfect condo or patio home for sale in Louisville, KY, or condos for sale in Oldham County, Kentucky and are tired of being told, “Too late, it’s already sold!” Just for you, here’s a link to the Condominiums, Patio Homes, Townhouses, Lofts, and Stand Alone Condos listed in the last 7 days with the Greater Louisville Association of Realtors. Don’t worry, you don’t have to jump from website to website any more. 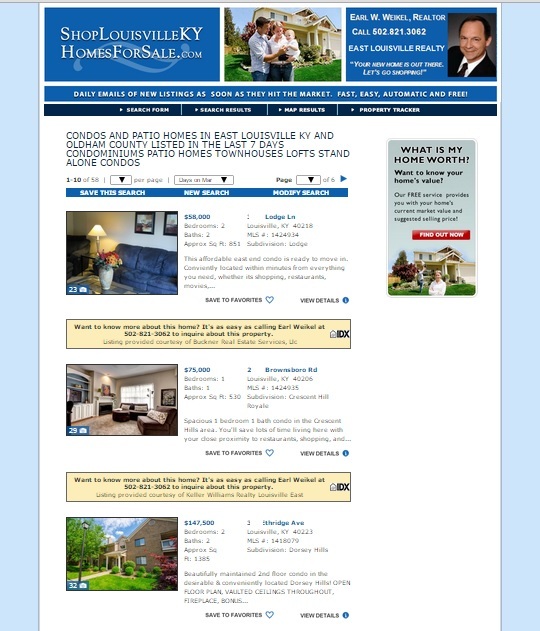 Our real estate website, http://www.shoplouisvillekyhomesforsale.com/property-search/list/?searchid=6120883 is updated daily so you won’t miss out! See something you like? Call Earl Weikel at 502-821-3062 seven days a week!